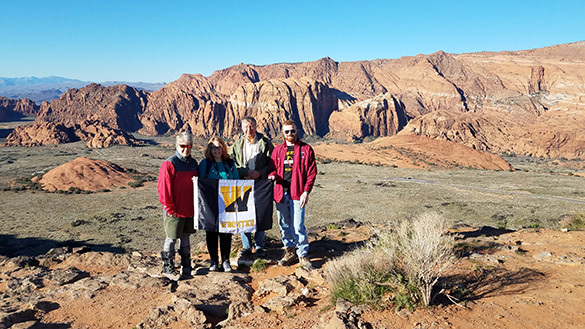 Hurricane, Utah — Our expedition had its final official fieldwork today, which we marked with a group photo overlooking the magnificent Snow Canyon. See the end of this post for alternative flag group images! Tomorrow the group visits Zion National Park. 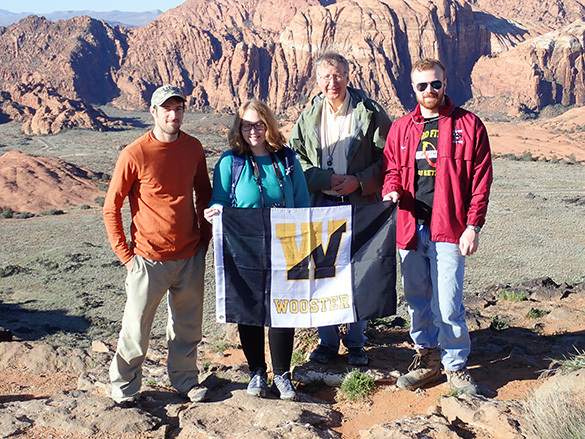 The next day will be spent exploring the local geology and culture, and then it is packing up our samples for shipment to Wooster. Today, though, The Carmel Formation calls one last time! 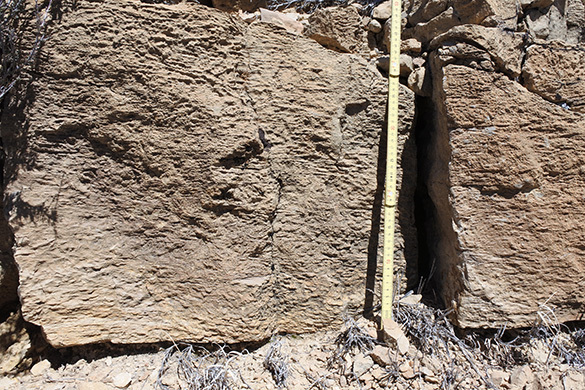 We returned to the extensive Carmel outcrops in Dammeron Valley, looking at the northernmost extension of the ooid shoal facies. 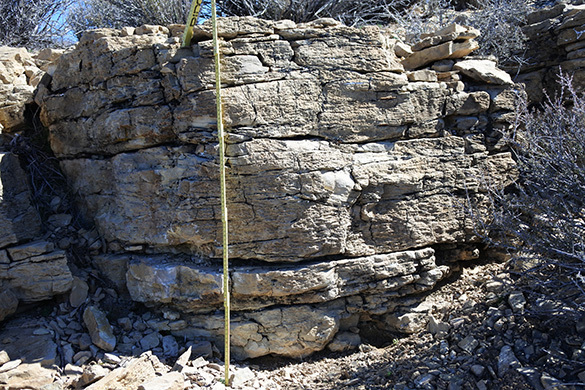 Here is our short shoal section at Dammeron Valley North (DVN), which consists entirely of cross-bedded limestones placed in four subunits (A-D). 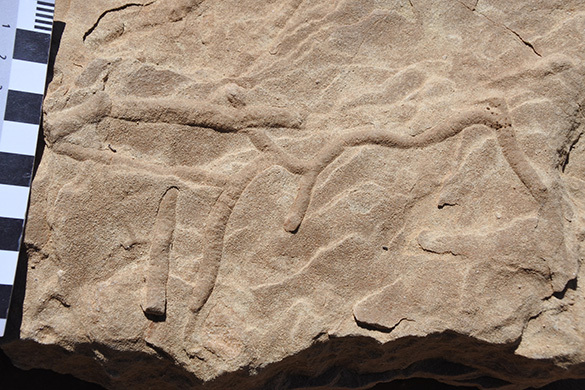 This exposure weathered into many loose slabs from the upper subunit D. The trace fossils are well preserved, including this Planolites with rare branching. It is convex hyporelief. 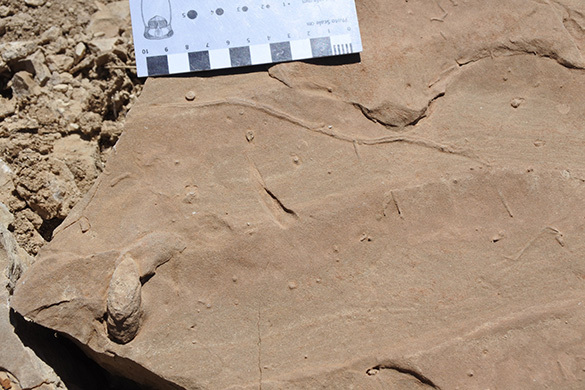 The traces here include a sinuous bilobed Gyrochorte and a thick trace in the left foreground I can’t yet identify. Anna found this rippled slab. This big trace Evan found is almost certainly Rhizocorallium. We originally thought that our section today (DVN) was an extension 638 meters to the west of the DV shoal unit. Nick and Shelley did excellent stratigraphic detective work to show that DVN is about 15 meters below the DV measured unit. We thus found the eastern equivalent of DVN at the DV location, measured and sampled it. For now we call it “DVN at DV”. 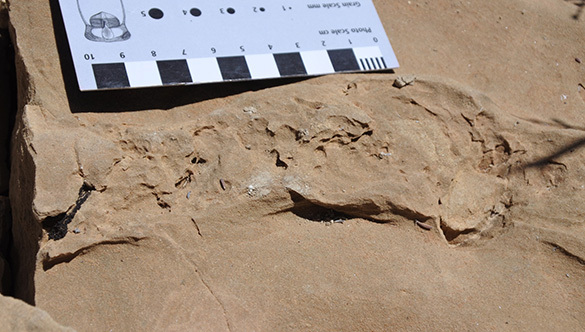 More detail than anyone wants to know, but these blog entries are also a kind of field notes! 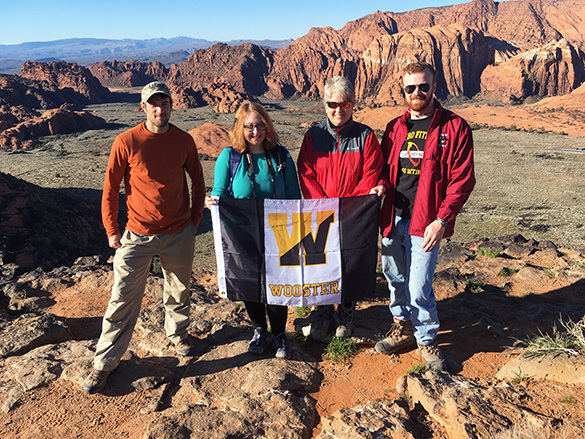 The traditional Wooster flag group photo as taken by Shelley. The flag group photo taken by Nick.